For entertainment, the Baby Einstein products are a must. I love every one of them, DVDs, books and CDs, educational, colorful and fun. We all are aware of the dangers of the old time baby walkers, so I decided to buy a stationary activity center instead. After browsing both online and retail stores, I purchased the Baby Einstein Caterpillar Discover & Play Activity Center. Mireya was 4 months old when she started using this activity center. As expected, my aspirations to strengthened Mireya's muscles and help her coordination skills did not end up there. I also got the Jump & Go (by Evenflow), despite the negative reviews, Mireya had a blast using this jumper and I enjoyed every minute of it. I was actually surprised and puzzled by all the bad reviews. I used to collect action figures (The Simpsons and Star Trek), but now I think I found a new "collection". My new collection is the Tolo Toys. These toys are beautifully designed with rich colors and fun shapes. Mireya loves to play with these toys over and over again. I purchased over $100 worth of toys, and my favorites are the Baby Concerto Dancing Teddy ($28), the Rolling Ball Shape Sorter ($17), and the Musical Bear ($15). 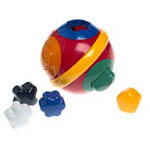 It is obvious that Tolo designed these toys with safety, durability and play value in mind.